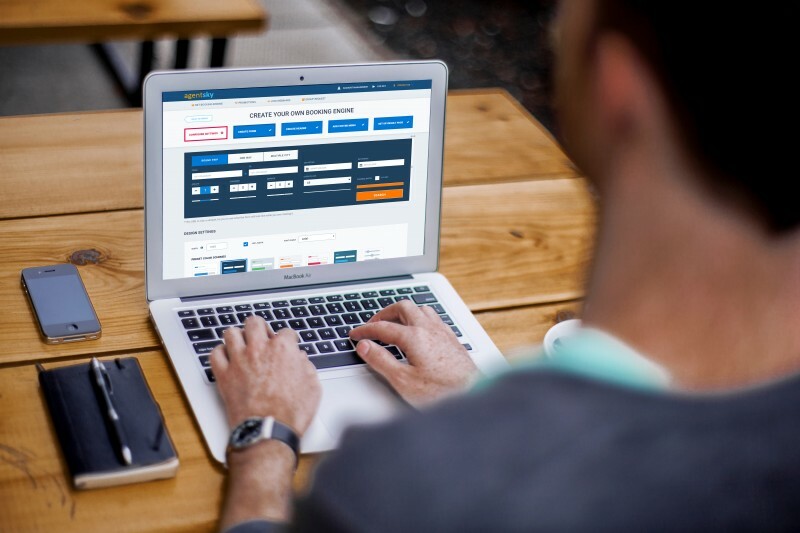 Online Booking Engine from AgentSky: Boost Your Airfare Sales! Get more bookings on your own website with Online Booking Engine for Travel Agents. Imagine having a convenient booking platform installed directly to your website. A real airline tickets search form for you and your customers. With AgentSky.net Online Booking Engine you get a chance to display our travel product content on your website! It is easy to set up and configure and is very intuitive to use. The best thing is that it is completely customizable to fit your design and branding. So don’t waste your time and try it now for free! Online Booking Engine (Internet Booking Engine) is a technology that makes possible for you to display AgentSky travel product on your own website. It allows your clients to book international and domestic airfares directly from your website. More importantly, you can set your own markups and get your earnings each month with any method that is convenient for you (PayPal, Bank transfer or via check). Get the best deals for your clients! By installing AgentSky OBE on your website, you open limitless possibilities for your clients giving them access to all of our airline tickets exclusive offers. Our booking engine is powered by Global Distribution System, that is why we always have the most relevant information regarding international and domestic US airfares. With AgentSky Online Booking Engine you open the world of lowest international airfares to your clients. We know that you’ve been working hard on your website improving your design to maximize user experience. So we came up with a very easy way to customize our OBE to best fit your vision. In just 5 easy steps you can customize the search form and the results page to your own taste. Customize your header and footer. If you want search results page to fit overall design of your website, you can adjust the colors of header and footer and add your logo for branding. If you don’t have logo, we can just put the name of your website or company to personalize the design. Add your personal information. You can add your contacts to the contact us menu in the header and add any links to the footer menu. That way you create a convenient user interface for your customers. We offer a completely white label booking engine so there will be no references to AgentSky.net on your website. We want you to get creative with all the customization we offer to give your clients the best experience. Get it for Free with Booking Trade-In Program! And here comes the icing on the cake: you can get it now for free! We offer a free trial for the first month of use. But if you want to extend your subscription we have a special offer for you! For every reservation made with one of your active OBE you get a $10 credit to pay for your subscription package. We encourage you to issue more bookings, earn more money and don’t pay for this amazing Online Booking Engine at all! Sounds awesome, right? So don’t waste your precious time! Get your one-month free trial here.